The Baltimore Orioles franchise that would eventually become known as the New York Yankees moved to Manhattan, 115 years ago today. The Orioles, a charter franchise of the American League in 1901, posted a 68-65 record that year but slipped to 50-88 in the 1902 season. The Orioles had been wrought with financial problems, but on Jan. 8, 1903, Frank Farrell and Bill Devery bought the club for $18,000 and moved the team to Manhattan to become the New York Highlanders. The Highlanders played their games at Hilltop Park until 1913, when the the team moved to the Polo Grounds. The nickname “Yankees,” which had started appearing in newspaper columns, was officially adopted in 1913. 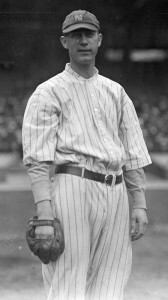 George Mogridge threw the Yankees’ first no-hitter in 1917 at Boston’s Fenway Park. The Yankees moved to the Bronx in 1922 to play ball in the newly built Yankee Stadium, but it would be 16 years before the House That Ruth Built would see its first Yankees no-no (“Sad” Sam Jones threw his 1923 no-no against the Philadelphia Athletics on the road at Shibe Park). The entire list of Yankees no-hitters can be viewed here.